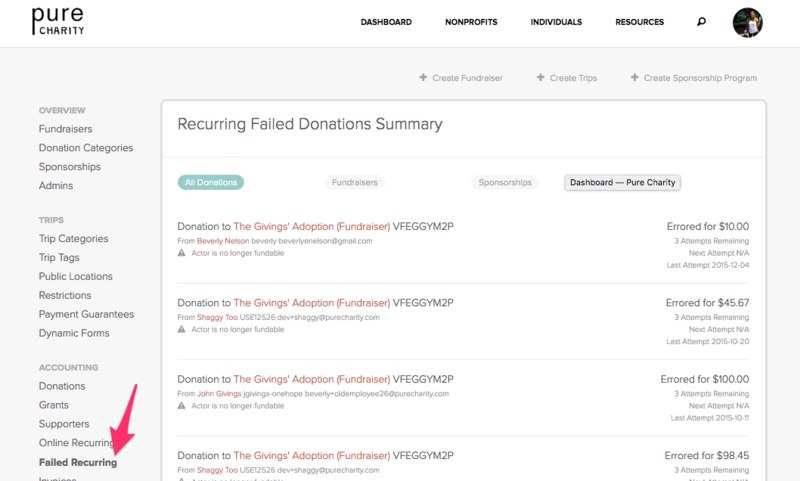 The Failed Recurring donations tab is available on your dashboard to allow your organization to have visibility into monthly payments that are failing for your donors. This tab will include monthly payments for all Fundraisers, Sponsorship Programs and general Field Partner Contributions. Pure Charity will retry a donors card 3 times. The donor receives 4 emails from us with notifying them before each charge is attempted, plus instructions on how to update. Once the three tries are done, the organization will have to reach out to the donor if they would still like to keep in communication. To access the Failed Recurring tab, please go to your organization dashboard and click Failed Recurring under accounting. If you have additional questions, please feel free to reach us at account.management@purecharity.com.